Trouble-plagued singer Amy Winehouse says that the long wait for her next album will be over by the end of the year. "The album will be six months at the most," Winehouse told London's Metro this week at the premiere of horror flick Psychosis, directed by her new boyfriend Reg Traviss. According to Winehouse, "It's going to be very much the same as my second album, where there's a lot of jukebox stuff. I just can't wait to have some new songs [to perform] on stage." But are her words to be trusted? 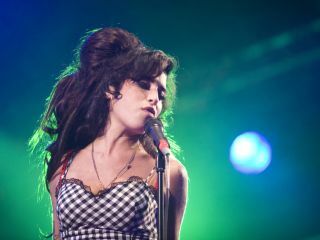 In the four years since she released her career-making album Back To Black, Winehouse has been the stuff of tabloid dreams (substance abuse, hospitalizations, her destructive marriage to Blake Fielder-Civil), and even her producer, Mark Ronson, has his doubts about her ability to finish an album. "Amy hasn't been working on her next record," he told The Sun. "When she's got 10 songs then we'll go down to the studio together." Underscoring these sentiments, Winehouse made a guest appearance at Ronson's recent London gig - while performing their collaboration, Valerie, the singer forgot some of the words. "Mark and I recorded two versions of Valerie," Winehouse later explained. "We released the one that came out like the Supremes, but I play the other version with my band. When I got there I completely forgot it was his version we were singing so I was probably a bit out of sync."